I'm no fan of much of modern apologetics. So much of it seems to believe in a secular autonomous reason; it gives in to the narrative of secular reasoning. This book reminds us that apologetics is not simply about reason/logic (though the Faith is reasonable and logical), but is also to remind us that Christianity is also good and beautiful. Read this book! What does it mean to describe apologetics as “imaginative?” The authors of this volume construe the designation in at least two ways. First, it means a greater interest in imaginative works (i.e., literature and the visual arts). But more fundamentally, imaginative apologetics entails a rejection of the dichotomy between reason and imagination: apologetics rightly concerns faith’s appeal to reason, yet “all human reason is imaginative” (xxv). Written as a rejoinder to the “new atheists”, the authors of this volume find that these atheists have embraced a truncated, unimaginative version of reason that refuses to ask the most important questions. In contrast, the authors set forth a vision of apologetics that seeks to immerse itself deeply both in the Christian tradition and the human condition. Faithful apologetics must embrace both intellect and desire, seeking the good and the beautiful as well as the true. The volume includes ten chapters written primarily by Anglo-Catholic scholars working in the British context (John Milbank wrote the preface, and the book is largely in line with the vision of Radical Orthodoxy). Chapters 1-2 consider the relationship of faith and reason. John Hughes (ch.1) attempts to explicate a middle way between modern rationalism and postmodern irrationalism concerning proof and persuasion. Taking a page from MacIntyre, Hughes writes that our strategy should be not to employ “knock-down” proofs, but rather to use a kind of deconstructive critical theory to expose both modern and postmodern individualistic autonomy. He also writes that the arguments that persuade do so not just because of some irrefutable logic but because they manifest intrinsic goodness and even beauty, especially when they are enacted in our lives. This is the kind of apologetic defense appropriate to our time: “not proofs, but critiques, genealogies and explorations, persuasive and attractive narratives that help us to make sense of our intellectual and cultural situation and inspire us to participate in them” (11). Andrew Davison (ch. 2) continues this line of argument by connecting apologetic witness to the Christian community, arguing that rather than seeking to persuade on “neutral” grounds, the only logic that can truly persuade is situated, embodied in vibrant Christian community. Thus to invite a person to consider Christian belief also involves an invitation to Christian community. Chapters 3-5 focus specifically on the role of the imagination as a cognitive faculty. Alison Milbank (ch. 3) argues that the imagination is “a philosophical tool that helps us reason by providing an epistemology, a way of knowing, that is inherently religious” (32). Here she draws heavily from the Romantic Movement which sought to re-enchant the world through the imagination, to “make the world strange” again and thus to awake wonder, desire and a homesickness for the truth. In making her argument, she attempts to balance imaginative idealism with an emphasis on the “otherness” of reality, which impresses itself on us beyond our ability to project ourselves on it. Thus imaginative works confront us with the depth of reality, in striking contrast to the flatness found in the atheistic picture of the world. Michael Ward’s chapter on C.S. Lewis (ch. 5) is a wonderful summary of the latter’s synthesis of reason and imagination. Donna Lazenby’s chapter (4), though well written, seems out of place in this section, in that it is a reading of contemporary literature, focused on understanding the implicit worldview behind imaginative works rather than the imaginative faculty itself. Chapters 6-7 continues section one’s focus on enacted faith with a digression on Christian ethics as apologetics. Stephen Bullivant’s chapter (6) follows Vatican II’s imaginative investigation into why so many were responding negatively to the Church. Bullivant quotes Gaudium et Spes’, which argues that a key remedy for atheism is the “testimony of a living and mature faith… penetrating the entire life, event the worldly activities of believers… moving them to justice and love, especially towards those in need” (91). In other words, one of the most powerful arguments against atheism is a saint. Craig Hovey (ch. 7) argues that when Christians live faithfully, this produces a joy and fuller humanity that is itself part of the good news. Chapters 8-10 attempt to situate apologetics within the contemporary cultural imaginary. Graham Ward’s chapter (8) is a synopsis of his method in Cultural Transformation and Religious Practice, and is a concise introduction to cultural hermeneutics. Ward here argues that while all humans are sign interpreters, those who seek to be excellent as apologists should become adept at critical theory: “without an in-depth reading of the culture they will not be effective; people won’t listen because apologetics is not helping them to understand something about that culture they have not seen before” (125). Richard Conrad (ch. 9) situates apologetics within several historical portraits of Christian apologists presenting the faith attractively and respectfully, both welcoming what is valid and challenging what is not. Alister McGrath (ch. 10) writes the volume’s final chapter on the relationship of apologetics and the natural sciences. His primary aim here seems to be setting us free from various ideological pictures that hold us captive: that science is at war with religion, or that science will eventually explain everything. Science serves us best when it recognizes its limitations; apologetics accordingly must not just appeal to rationality but also to morality and to beauty. Despite the promise of the title, I found the volume disappointing. The chapters were in most cases too brief to make a significant argument, and many of the primary themes explored here are developed substantially elsewhere: apologetics as critical theory, the necessity of Christian community, illustrative interaction with cultural works, etc. The primary contribution of this volume, however, is the choice to put the spotlight on the imagination itself, even if only for a couple of chapters. Deeper investigation of this critical faculty is needed if we are to understand what it really means for us to call apologetics, or theology, or discipleship imaginative. I debated whether to give this interesting little book three stars or four, and in the end I settled on three primarily for reasons of personal taste. I simply didn't enjoy it as much as I have enjoyed most of the books I have rated four stars, but make no mistake: this is a good book. 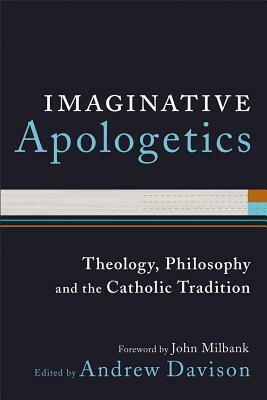 "Imaginative Apologetics" is a collection of essays advocating a "different" view of apologetics (i.e. different than your average contemporary apologist). It emphasizes the importance of appealing to the imagination, wonder, and desire to help people glimpse a Christian perspective on the world. Without this, apologetics tends to be a dead, soulless, and probably futile project. A chapter on C. S. Lewis' apologetic and a chapter on the use of literature in apologetics were particularly interesting explorations of this point.The early chapters of the book, however, were a critique of an alternative approach to apologetics--an approach (as one essayist pointed out) that is exemplified in Oxford philosopher Richard Swinburne's cold, dry, probabilistic calculation that Christianity is likely true. Many of the points made in these early chapters were good ones, but the trouble I had with this portion of the book is that I really don't think there are very many Swinburnes out there. Most apologists recognize that effective apologetics is not a simple matter of mechanically constructing arguments or "following the evidence wherever it leads." Rather, they recognize that people have worldviews, presuppositions, and different intuitions about what is rational, that human reason is not the final authority, and that faith is not (or at least not exclusively) based on arguments. So some (though not all) of the criticisms of what we might call "unimaginative apologetics" were too simplistic. I was also surprised that nearly every chapter made reference to the "New Atheism." Personally I think that secularism is going to increasingly give way to other apologetic concerns in the not-so-distant future (Islam, vague "spiritualities," etc. ), but the focus on atheists like Dawkins and Dennet in even this very "different" look at apologetics further evidences the role of the New Atheism in the modern resurgence of Christian apologetics.The core message of this book--that imagination and wonder can (and need) to play a bigger role in apologetics--is one that should not be dismissed without serious consideration. In fact this may be the secret to the success of some of the most popular apologists, such as C. S. Lewis and Ravi Zacharias. In particular, I would commend this book to budding apologists and to those who are interested in the study of apologetic methodology. I heard about this book from Ken Myers' Mars Hill Audio Journal a few years ago. The interview with Andrew Davison was so fascinating it made me excited about what I'd read in this book.The title by itself makes me uncomfortable. "Imaginative". Nice. This word strikes me as a buzz word liberals like to use, but I was willing to give the book the benefit of the doubt because of the great interview. I don't want to be too simplistic and dismissive of things. That would be just like me. I'm a jerk on a good day.The essays in the book are uneven. Some of them are really engaging and helpful, and these best ones are early on in the book. As the book goes on, however, the quality of the essays drops off significantly. The great stuff in this book is what I view as an application of Cornelius Van Til's apologetics. It is VERY odd that his name is never mentioned anywhere in the book, as though none of the writers have read him or even heard of him. They're standing on his shoulders, and I don't understand why they missed him.Overall, there is too much liberal junk in the book. Ridiculous stuff like the gospel is a "true myth." What does that mean? It seems like a wishy-washy way of saying, "I sure hope this myth is the right one." Maybe I'm too harsh. The most frustrating essay was by Conrad Op. He wants me to engage in apologetics "respectfully," in the sense that I'm supposed to respect other worldviews. He says it on every page like that. How is that possible? I read the Psalms and don't see much respect for pagan ways of thinking in them. He who says there is no God is a FOOL. They are corrupt. Why should I respect folly? The wicked slay the orphan and the widow and think God does not see. Does He who made the eye not see?! Does He who warns the nations not judge? But Op says I should respect those alternative views of the cosmos. I cannot. I MUST be kind and loving for sure, but NEVER respectful.Op also wants me to "welcome home all that is valid" in other insights and instincts that are pagan. That doesn't make any sense. If the insight or instinct is valid, it is because it is part of the Christian worldview. You don't "welcome it home". You point out to the unbeliever that it was never his in the first place and that he's being inconsistent with his worldview to hold that "insight".I'm pretty glad to be done with this book. I will probably revisit some of the good essays, especially the ones on literature, but the last few leave me in a bad mood. As with any collection of essays, there are some hits and misses. I suspect that the hits and misses will vary by reader. For instance, I have been heavily influenced by C.S. Lewis, and thought Michael Ward's chapter (which draws heavily on Lewis) was outstanding. On the other hand, I was lost in Bullivant's essay - but I suspect that, were I Catholic, it would have been a highlight.The book calls for rethinking how apologetics is done, with more of an emphasis on the imagination. It does not call for tossing the baby out with the bath water but does make a compelling case for expanding how we view doing apologetics. I am a bit conflicted on the rating because the volume is a bit uneven. Overall, the book is helpful because it moves beyond the traditional evidentialist/presuppositionalist categories and reforms apologetics in a helpful new direction, one that is sensitive to the imagination and particularly to the role the that moral imagination plays in truth commitments. Really good. Especially Milbank and others on imagination and reason. one of the best books I've read in years. Made me think deeply over and over again. Andrew Davison JohnHughes Alister E. McGrath Alison Milbank Donna J. Lazenby Stephen Bullivant Craig Hovey Graham Ward - Andrew Davison (DPhil, University of Oxford) is the tutor in doctrine at Westcott House, University of Cambridge, in Cambridge, England. He has taught theology at St. Stephen’s House, Oxford, and is known for his writing on doctrine, mission, and the church. He is coauthor of For the Parish: A Critique of Fresh Expressions and joint editor of Lift Up Your Hearts.